Simon learns the truth behind the Jack the Ripper murders – “Jack” was stopped by Will Herondale and his institute of Victorian Shadowhunters. Glorious, magical, stunning book. I can not wait to read the rest in this series. Definetly one of my favourite writers. Loved the Mortal Instrument series? 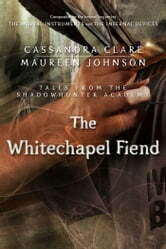 Then you'll love this short story that reveals the background of Shadowhunter figure Will Herondale. Great read but over far to quickly!